After seven decades of civil war, underdevelopment and social and political stagnation, the Government of Myanmar has declared its vision of building a peaceful, prosperous and democratic Myanmar. The government is committed to aligning national priorities with the 2030 Agenda and the Sustainable Development Goals (SDGs) and seeks their integration into economic and sectoral policies and plans. The UN System is supporting the people and the Government to achieve national development priorities and aspirations. Over the coming years, the UN will remain focused on supporting the implementation of reforms and transitions though four main pillars: socio-economic development, peace building, humanitarian action and human rights. 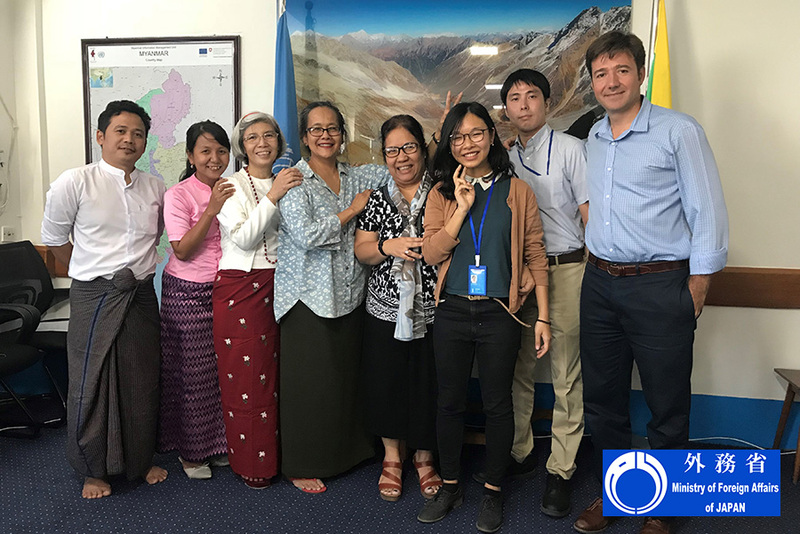 Sho Matsumura (second from right), HRD-UN Volunteer M&E and Reporting Officer in Myanmar, with the members of his team in the Resident Coordinator's Office. Under the direct supervision of the Head of Development Coordination Cluster within the Resident Coordinator's Office, Sho Matsumura served as UN Volunteer Monitoring, Evaluation and Reporting Officer under the Human Resource Development Programme for Peacebuilding and Development. He was responsible for the planning and implementation of the overall UNDAF monitoring and evaluation framework, which covered management arrangements, annual and mid-term reviews, evaluation plan, as well as ownership of the Results and Resources Framework designed to assess and enhance the effectiveness, sustainability and impact of implementation. During his 12-month assignment, Sho contributed significantly, developing the overall Results & Resources Framework and identified technically sound and clearly defined SMART indicators, baselines and targets. Sho also strengthened the alignment of the framework with the draft Myanmar Sustainable Development Plan, the new Myanmar Development Assistance Policy and the SDGs with a strong focus on leaving no one behind and human rights principles. "The need to strengthen the Humanitarian-Development-Peace nexus is clearly spelt out throughout the UNDAF, with a strong focus on human rights," Sho said. "It is looking to strengthen linkages across the humanitarian-development-peace nexus to ensure a conflict sensitive and 'do no harm' approach for UN agencies and partners and to achieve longer-term development goals." In providing support to the formulation process, Sho said that he has developed his expertise in strategic planning, monitoring and evaluation, annual reporting, and UN system coordination. "I have increased my understanding of the peace-development-humanitarian nexus and the UN’s engagement and negotiation in humanitarian crisis." Sho also became a strong advocate of volunteerism during his time in Myanmar. "I was actively engaged in a range of activities to promote volunteerism at the national, sub-national and community levels, led by the UNV Field Unit based in Yangon. These activities include workshops on volunteerism and disaster preparedness and response, the commemoration of the International Volunteer Day and othis International Days, SDGs awareness-raising campaigns and the UNV Buddy Programme for newly-arrived UN Volunteers." "Moreover, I provided stories and comments on field experiences for the UNV Field Office’s publications, websites, newsletters and press releases. The UNV Field Office has been playing a key role in promoting volunteerism on the ground and in enhancing partnerships with a range of partners and stakeholders across Myanmar," said Sho. Sho’s supervisor, Pablo Barrera, Head of Development Coordination Cluster in the Resident Coordinator's Office, spoke highly of his contribution.